OSHA stands for Occupational Safety and Health Administration. OSHA creates and enforces safety and health regulations to ensure that employees work in environments that are free from recognized hazards. This kit is designed to help in OSHA Standard Compliance (1910.1030) and combines personal protection and clean-up items mandated by OSHA, CDC, and State Health Departments to aid in the clean-up, transportation, and disposal of potentially infectious blood or body fluid spills. To learn more about the Safetec® UP Kit, please click below. 1. 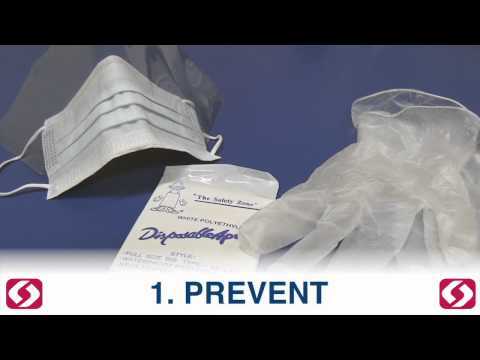 PREVENT – to prevent direct contact with the spill during the cleanup process and minimize the risk for infection, disposable protective clothing must be worn. This includes gloves, combo mask/safety shield, and a protective apron. 2. CONTAIN & REMOVE – to efficiently contain and remove the spill, a solidifying agent (Safetec® Red Z®) and scoop/scraper are to be used and the spill contents are to be disposed of in a red biohazard bag. 4. DISPOSE – discard the germicidal wipe, gloves, safety shield and apron into a red biohazard bag and dispose of the bag as required by your local, state and federal regulations. To download these five steps on how to contain and remove a bloodborne pathogens spill, please click below. **All personnel must be trained in the use of the spill kit before any cleanup process is performed.